This is an L.P. that anyone would be mighty glad to play at a party. Indeed there would be many who would be delighted to have Mrs. Mills join such convivial occasions. With Mrs. Mills around, things would be sure to go with a swing—just listen to her joyful version of Good morning! Any "morning after the night before" feeling would be quickly dispelled by this cheerful greeting on the piano ivories! 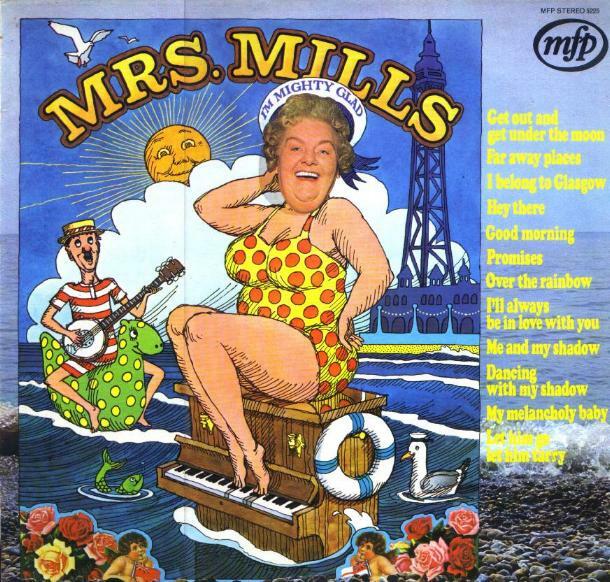 Mrs. Mills also weaves magic with Me and my shadow and I'll always be in love with you, as well as her version of the Ken Dodd favourite, Promises, while Far away places have never seemed so exciting as when Mrs. Mills interprets them. Nobody could be melancholy for long when they listen to My melancholy baby, and all the other well-known melodies on this L.P. . . .